Source: Received as budwood by H.E. Drobish, County Agent, Oroville, Ca, 1925. EMN, 1985: Budwood from "Mother" orange tree at Bidwell Bar. Tree very large, old, and healthy. Grown for sweet orange stock seed. Look up Citrograph, Nov. 1923, for article by Mr. Drobish for further description. This accession had seedling yellows, removed by thermotherapy (Thermo 1128-9). EMN, 01/12/1987: Fruit of this and other sweets collected by people from Florida looking for a better juice variety; these fruit juice analyses rec'd from Bill Castle: [It included a table; refer back to the card] Table continued on back of CRC 3858 (Pineapple swt) accession card. 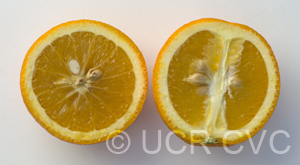 EMN, 02/08/1988: A typical seedy, mid-season sweet orange. Trees doing well, good crop. 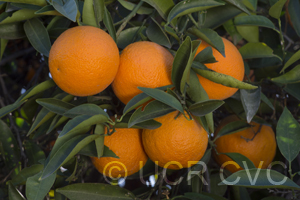 Bidwell's Bar is an example of the type of oranges that were most commonly grown in California before the Washington navel orange arrived on the scene. 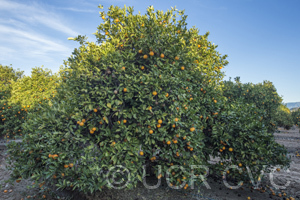 The original Bidwell’s Bar tree was planted in 1856 in Butte County, California and is often called the “Mother Orange Tree.” It is still alive and is believed to be the oldest living orange tree in California. Availability: Not commerically available in California.